Jessica is a Jasper native and resides in Ireland, IN. She is a 2013 graduate of USI where she earned her bachelor of science degree in dental hygiene. Practicing since 2013, Jessica has gained experience in both corporate and private practices. Her favorite things about being a hygienist are building relationships with patients and easing fears and anxiety. 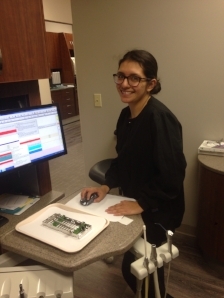 Kaci is a graduate of Forest Park High School and has worked in the dental field since 2006. She has been married to her husband, Kyle, since 2009 and has two sons, Koby and Kade. Kaci resides in Ferdinand and enjoys spending time with family and friends, being outdoors, and attending Forest Park Ranger athletic events. Judy graduated from Jasper High School and received her certified dental assistant certificate from USI. She then received her expanded duties from IU Dental School. Judy has worked in the dental field for 35 years and currently lives in Ireland with her husband. She has three daughters and enjoys being outdoors, hiking, jeep riding, and traveling. Becky has been in the dental field for over 20 years. She has lived in Pike County on a farm for 40 years. Becky has two children, Alex and Lauren. In her spare time, she enjoys watching softball with her daughter, doing embroidery, and loves antiquing. Mandy graduated from Jasper High School in 2009 and completed the dental assisting program with her radiography license from VUJC in 2012. She is married to Aaron Hopf and has two daughters. Mandy loves spending time with family and being outdoors. Maria graduated from Heritage Hills High School in 2014. She received her Dental Assisting Degree and her Expanded Duties from USI in 2017. She currently lives in Dale, Indiana. Maria enjoys listening to music and spending time with family and friends.